Mark is illustrating his second Who Was book: Who Was Charles Dickens? Pub date: December 4, 2014. Mark is doing a cover for the new Russian edition of The Green Mile. The book will feature 68 pencil drawings by Mark originally published with Subterranean Press along with the six pen & ink illustrations originally published by Dutton Signet in 1996. Mark is illustrating a new Stephen King short story called Summer Thunder. Cemetery Dance Publications is publishing Summer Thunder in an anthology called Turn Down the Lights, pub date: December 17, 2013. 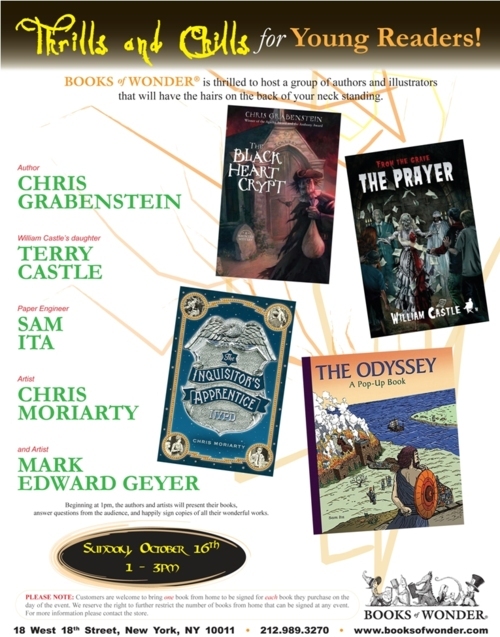 Mark will be signing at Books of Wonder in NYC, November 3, 2013. Mark will be signing at Avid Bookshop in Athens, Georgia on Saturday, October 19th from 10:30-11:30AM. For details click here. Mark is illustrating his first Who Was? book for Grosset & Dunlap: Who Was Ulysses S. Grant? The Tower of the Five Orders, the second book in The Shakespeare Mysteries, is a fall 2013 Junior Library Guild selection. Secrets of Shakespeare's Grave has been voted by Children's Book Committee at Bank Street College of Education as one of the Best Children's Books of the year (2013), Adventure and Mystery category. The Watcher in the Shadows by Chris Moriarty gets starred reviews from Kirkus and Booklist. by Chris Moriarty October 16, 2011. The Inquisitor's Apprentice was voted one of the Best Illustrated Chapter Books of 2011 by Kirkus Reviews. Mark is named an Ambassador for Rotring pens and pencils, Hamburg, Germany. Mark and his wife, Marianne, get to spend a few minutes with Stephen King, December 2011.